The world’s first 2MW PEM fuel cell power plant has been successfully designed, constructed and integrated into a chlor-alkali (CA) production plant, in Yingkou China. The chlor-alkali production plant produces chlorine and caustic soda (lye) and high purity hydrogen. The hydrogen contains almost 45% of the energy that is consumed in the plant. In many cases this hydrogen is vented. The project demonstrated the PEM Power Plant technology for converting the hydrogen into electricity, heat and water for use in the chlor-alkali production process, lowering its electricity consumption by 20%. Developed open-source calculation tool for preliminary economical assessment. Several publications and presentations at conferences. Within the DEMCOPEM-2MW framework, the Politecnico di Milano developed a simple, open-source tool able of calculating how much energy can be produced with wasted Hydrogen (from different sources), and what could be the size and main features of a PEM power plant designed to utilize a given amount of hydrogen. The calculation could be useful for many industries dealing with waste H2. 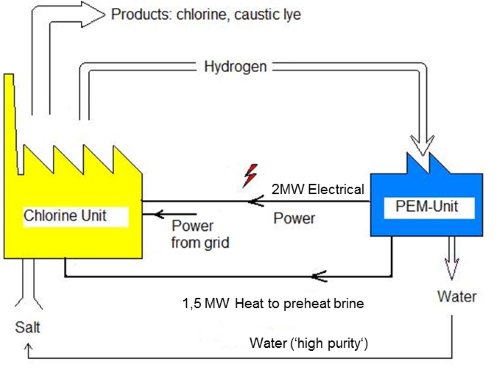 To calculate the preliminary size of a hydrogen PEM plant, please click the button. The PEM power plant will be fully integrated into the chlorine production unit and will also be remotely controlled. The water produced by the oxidation of hydrogen is also used. To reduce the (maintenance) cost of the integrated plant special emphasis is put on the longevity of the fuel cells (especially membranes, electrodes and catalyst) and to lower the manufacturing costs. The design is optimized for minimal energy loss. Extensive diagnostics and data acquisition are incorporated to monitor the performance. The demonstration will take place in China as this is the ideal starting point for the market introduction. High electricity prices (up to 2 times higher than in Europe), 50% of the chlor-alkali world production and rationing of electricity all contribute to the business case.